First let me just say that this is a very rich dish not meant to be eaten in large portions. A wonderful lunch or dinner with a salad eating only a small serving size. Eating rich dishes and staying thin is all about portion control and exercise. It’s important to me that I don’t encourage anyone to over eat. With that said let’s get on to this wonderful bread pudding. 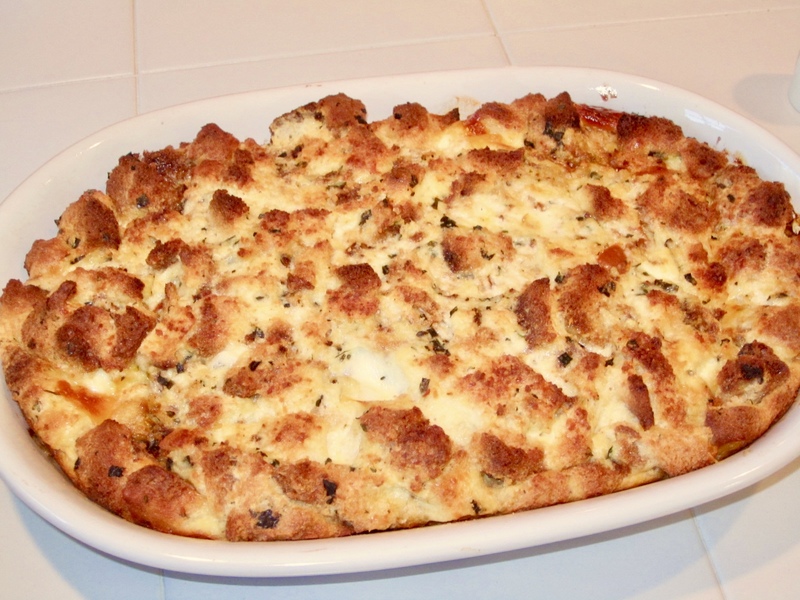 Until recently I only thought of bread pudding as a rich dessert that I occasionally indulged. One summer in New Hampshire I ordered a savory bread pudding and I was hooked. I made my bread pudding with heirloom tomatoes that I picked fresh from my garden along with my fresh herbs. You can add different veggies to recipe. Experiment, have fun and enjoy a wonderfully richly flavorful dish. Heat oven to 375 F. Butter or spray with cooking spray a 13x9x2-inch baking dish. Cut bottom crust and short ends off bread, discarding. Cut remaining bread with crust into 1-inch cubes(about 10 cups loosely packed). Place cubes in large bowl. Add oil, thyme, basil, oregano and garlic; toss to coat. Spread bread cubes out on large baking sheet. Sprinkle with salt and pepper. Bake until golden and slightly crunchy, stirring occasionally, about 15-20 minutes. Return toasted bread cubes to the same bowl. Add olive oil to large skillet. Add shallot and garlic saute about 5 minutes stirring occasionally. Add tomatoes continuing to cook for additional 5 minutes. Set aside. Whisk heavy cream, eggs, salt and ground pepper in large bowl. Mix egg mixture into bread. Place 1/3 of bread and egg mixture in prepared pan. Layer with 1/2 tomato then cheese. Continue layering 1/3 bread then 1/2 tomato and cheese then finally remaining 1/3 bread mixture. Sprinkle top with Parmesan cheese. Can be prepared 1 day ahead. Cover and refrigerate. Preheat oven 350 F. Bake uncovered until set and top is golden about 50-60 minutes. Let stand 15 minutes before cutting and serving.